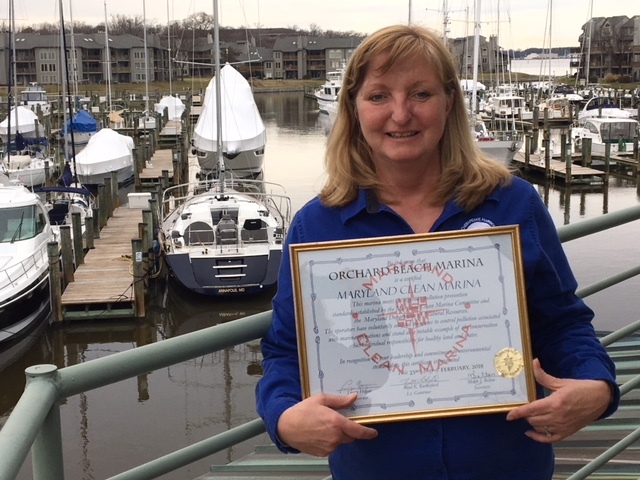 Orchard Beach Marina in Annapolis recently passed inspection by the Maryland Department of Natural Resources to become the latest Maryland Clean Marina, marking the 152nd marina to meet the state’s criteria. 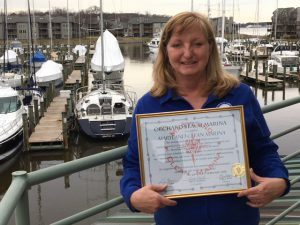 Fourty-eight of the estimated 165 marinas in Anne Arundel County are certified as clean marinas. Staff evaluate potential boatyards and marinas on areas such emergency preparedness, stormwater management and waste containment and disposal. To pass, a marine facility must score between 75 and 85 percent in each area of the award checklist by implementing voluntary practices from the Maryland Clean Marina Guidebook. At Orchard Beach Marina, manager Karen Fenwick promotes recycling of used antifreeze and oil to slip holders and posted new signs outlining dozens of ways that boaters can prevent water pollution. All clean marinas are re-inspected every three years to ensure compliance. The Maryland Clean Marina program was developed in 1998 by a committee of boatyard and marina operators, local and state government agencies, and academics and boating organizations with the goal of reducing nonpoint source pollution from marine facilities and recreational boats.